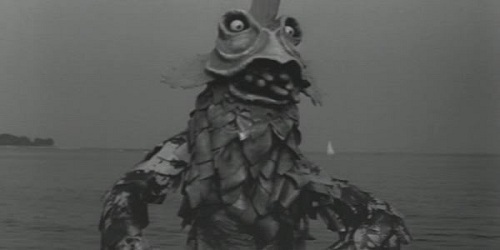 I object to the name sea “monster”. Its more like sea “awesome”. The process of unmaking monsters is often as illuminating as the process of making them. Not debunking them, rather historically revising them, for certainly a “hoax is a hoax, of course, of course” and humans are indeed predisposed to regard the unfamiliar with horror (evolutionarily important, since before we figured out that rocks were good for hitting things over the head with, it was a good bet that the unfamiliar was distinctly interested in eating you), rather I’m speaking of the steady and inexorable reinterpretation of phenomena into noumena (that which is known without the use of senses) over time. The mechanism by which conventional wisdom asserts itself to explain away the anomalistic across the years and establish the ever-elusive, scientific “truth”, a truth that is only ever at best admittedly partial (and thus discontinuous with some sort of universal verity), is in the sagacious words of Charles Hoy Fort, “like looking for a needle that no one ever lost in a haystack that never was”. When common folk report an encounter with a monster, the skeptical point out that they are after all, common, and thus easily mistaken, the presumption being that were a man of science, or some such luminary of our esoteric guilds of intelligentsia to experience the same stimuli which the representative of the unwashed masses misidentified as monstrous, the learned would correctly interpret its absolute normality, or if desperately necessary, its abnormality encapsulated within the boundaries of that which is designated as “knowable”. Unfortunately for the purveyors of universal truth that excludes the category of monster wholesale, sometimes learned gentlemen and ladies also report, investigate, and document monsters. And then, with exasperation, our institutions take the observations of the erudite that they themselves demanded as the standard of acceptable evidence, and decry the reports as “bad science” or “irresponsible scholarship”. Consider a concrete manifestation of this inexorable process in the strange history of the Gloucester sea serpent, also know by the scientific name assigned to it before it was relegated to the mythological dustpile, Scoliophis atlanticus. Gloucester on Cape Ann, nicknamed “America’s Oldest Seaport”, was one of the first English settlements in what would later become the Massachusetts Bay Colony, chartered by King James I in 1623. John Josselyn (died 1675) is best known for his works An Account of Two Voyages to New England and New England’s Rarities, discovered in Birds, Beasts, Fishes, Serpents, and Plants of that Country, considered to be some of the earliest and finest works on the flora and fauna of New England, recorded in 1639 a story related to him by local Gloucester gentlemen of an encounter with a sea serpent off Cape Ann, noting, “At this time we had some neighboring Gentlemen in our house, who came to welcome me into the Country; where amongst variety of discourse they told me of a young Lyon (not long before) killed at Piscataway by an Indian; of a Sea-Serpent or Snake, that lay coiled up like a Cable upon a Rock at Cape-Ann: a boat passing by with English aboard, and two Indians, they would have shot the Serpent but the Indians dissuaded them, saying, that if he were not killed out-right they would be all in danger of their lives” (Josselyn, Diary Entry, 1639). We don’t know a great deal about Mr. Josselyn, but he was clearly intelligent and educated, and some scholars believe his concise observations on the state of medicine in New England suggest he may have been a physician. But despite the fact that he clearly compiled documents of enormous value to naturalists, I have repeatedly seen him described by later historians as “a writer of almost incredible credulity”. This is the polite way of saying he would believe anything he was told. Josselyn expressed no opinion on whether the sea serpent story was true, simply mentioned the conversation, and as philosopher Ralph Barton Perry remarked, “I prefer credulity to skepticism and cynicism for there is more promise in almost anything than in nothing at all”. Josselyn’s credentials and presumed gullibility, despite his scrupulous attention to accurately cataloging the variety of animal and plant life in the colonies aside, the true proof in the pudding of the tale of the Gloucester sea serpent would re-emerge in a rash of well-documented sightings in 1817, with hundreds of additional sightings all along the Atlantic seaboard of America until about the 1950’s, when we really started to take these science guys seriously en masse, mostly because they had just recently demonstrated that they could blow us all to hell with atomic bombs. As a species we tend to be a little more respectful of people who can obliterate us with the power of their mind and a few willing engineers. Our best documentation appears in the 19th century, but the Gloucester sea serpent was not merely hibernating between 1639-1871, since a mere two years after Josselyn was told the story of the Cape Ann serpent, a puzzling little entry in Obadiah Oldpath’s (whose real name was James Robinson Newhall) 1862 book Lin; Or Jewels of the Third Plantation mentions a curious entry in 1641 from what is reportedly The Journal of Obadiah Turner. What’s particularly confusing is that Oldpath’s book is a series of biographical sketches of eminently real early settlers of Lynn, Massachusetts, but nobody is actually quite sure to this day that Obadiah Turner ever existed, let alone wrote a journal. This is not a new problem, for any of you who’ve ever found a juicy ancient Greek source, only to discover that the choice reference is a second hand quotation by Herodotus or Pliny from a book that nobody has seen in its entirety in 3000 years. Makes me want to haunt somebody for a few thousand years after my expiration date just so I’ll be around when they start searching for the Lost City of Hogwarts. While literary folks point out that there are some clear embellishments on the characters of the authentic personages depicted in Oldpath/Newhall’s book, it does in large part correspond to other materials on the early settlers of Lynn, Massachusetts. Whether Obadiah Turner truly penned a diary (or frankly even existed), popular consciousness seemed to admit of a sea monster lurking off the shores of Massachusetts, and the descriptions of said beast are consistent with later sightings. Lynn, Massachusetts is only roughly thirty miles south of Gloucester. Some being on the great beach gathering of calms and seaweed which had been cast thereon by the mightie storm did spy a most wonderful serpent a short way off from the shore. He was big round in the thickest part as a wine pipe; and they do affirm that he was fifteen fathoms [90 feet] or more in length. A most wonderful tale. But the witnesses be credible, and it would be of no account to them to tell an untrue tale. We have likewise heard yet Cape Ann the people have seen a monster like unto this, which did there come out of ye land much to ye terror of them yet did see him (Journal of Obadiah Turner, September 5, 1641). By the 1800’s, Gloucester was getting pretty crowded, experiencing an economic boom due to proximity to rich fishing grounds of the George’s Bank (an area of elevated sea floor extending from Cape Cod, Massachusetts to Nova Scotia). Those American’s reading this will no doubt be familiar with the yellow-raincoated Gorton’s Fisherman that adorns our finest frozen fish packaging. Well, Gorton’s of Gloucester was a commercial seafood business from the early 20th century that gained a national reputation. Although it is unlikely that there are bits of sea serpent in your fish sticks, the point I am trying to make is that if there is one thing the historical residents of Cape Ann know well, it is seafood, and how to coax said savory fish onto one’s plate. The people of Gloucester have spent the past 300 years earning their living from the sea, and historically, it would have been an important skill to be able to distinguish between recognizable and unrecognizable species of marine beasties. I mention this now, because later skeptics would blithely dismiss the 19th century Gloucester sea serpent reports by emphasizing the likelihood that observers were simply mistaking the movement of pods of dolphins, or some other mundane sea creature for a ghastly monster, willfully ignoring the fact that generations of these folks depended on their deep knowledge of the ocean for their livelihood and survival. Sightings of the Gloucester sea serpent resumed in earnest in 1817, filtering in from a variety of reputable and knowledgeable folks, from sea captains to seasoned sailors to town notables. We have no less than eighteen signed depositions given to a local judge in 1817 detailing the experiences. I, EPES ELLERY, of Gloucester, in the County of Essex, Ship master, depose and say; that on the 14th day of August, 1817, I saw a sea animal that I thought to be a serpent, in the harbor in said Gloucester. I was on an eminence, near low water mark, and about thirty feet above the level of the sea, when I saw him. I should judge that he was about one hundred and ﬁfty fathoms from me. I saw the upper part of his head, and I should say about forty feet of the animal. He appeared to me to have joints, about the size of a two-gallon keg. I was looking at him with a spy-glass, when I saw him open his mouth, and his mouth appeared like that of the serpent; the top of his head appeared lat. His motion when he turned was quick, but I will not express an opinion of his velocity. The ﬁrst part of the curve that he made in turning was of the form of a staple, and as he approached towards his tail, he came near his body with his head, and then ran parallel with his tail, and his head and tail then appeared near together (Linnean Society, “Deposition of Epes Ellery”, 1817). We hear this account from a seasoned mariner, followed by still others that are remarkably consistent in their descriptions of the Gloucester sea serpent. I, James Manesfield of Gloucester, in the county of Essex, merchant, depose and say: That I saw a strange creature, of enormous length, resembling a serpent. I think this was on the ﬁfteenth of August, A. D. 1817. I should say he was from forty to sixty feet in length, extended on the surface of the water, with his head above the water about a foot. He remained in this position but a short time, and then started off very quick, with much greater velocity than I have seen him move with at any other time. I saw bunches on his back about a foot in height, when he lay extended on the water. His colour appeared to me black, or very dark. It was a little before six o’clock P. M. when I saw him. I should say, he moved a mile in ﬁve or six minutes (Linnean Society, “Deposition of James Mansfield”, 1817). And again, more details from an independent witness from a different perspective, yet complimenting the descriptions of others. I, W1LLIAM SOMERBY of the schooner Laura, testify and say: That on Thursday last about 1O o’clock, A. M. as I was coming in said schooner from Newburyport, bound to Boston, off Brace’s cove, a little eastward of Eastern point, (Cape Ann) about two miles from land, the sea calm, I was at helm. Robert Bragg, one of the crew, asked me if that was not the snake coming, pointing out a break in the water, south of us; a strange animal of the serpent form passed very swiftly by us–the nearest distance I should judge to be between 30 and 4.0 feet-the upper part of his back and head was above water—-the length that appeared was about 12 or 1 5 feet, his head was like a serpent’s, tapering off to a point. He threw out his tongue a number of times, extended about two feet from his jaws—the end of it resembled a harpoon-he threw his tongue backwards several times over his head, and let it fall again-I saw one of his eyes as he passed; it appeared very bright, and about the size of the eye of an ox. The colour of all that appeared was very dark, almost black. He did not appear to take any notice of the vessel, and made no noise. There appeared a bunch above the eye—Should judge him to be about two and a half feet in circumference. Have often seen whales at sea. The motion of this animal was much swifter than that of any whale. The motion of the body was rising and falling as he advanced, the head moderately vibrating from side to side. The colour of his tongue was a light brown. To this account I am willing to make oath (Linnean Society, “Deposition of William Somerby”, 1817). There is a record of additional depositions regarding the Gloucester sea serpent from mariner Amos Story, ships master Solomon Allen, merchants William Foster and William B. Pearson, ships carpenter Matthew Gaffney, 17 year old sailor John Johnston, schooner master Sewell Toppan, sailor Robert Bragg of the schooner Laura, ship captain Elkanah Finney, as well as a number of letters regarding similar sightings up the New England coast to Maine. The description we have of the Gloucester sea monster from multiple accounts is that of a roughly 90 foot long snakelike creature, a horse-sized head that it periodically carries above the water on several feet of neck, and a body about 2 feet in circumference across the length of the beast. Many observers noted a curious vertical motion (“like a caterpillar”) when the critter was swimming, giving the appearance of humps, rising and falling in the water, as well as the odd behavior of occasionally stopping, and dropping like a weight into deeper water. Further reports trickled in from as far South as Long Island Sound near New York. On Sunday, the 5th inst. at 10 o’clock A. M. while standing a few rods from my house on Rye-Neck, I observed at a small distance to the southward and eastward of Mr. Ezekiel Halsted’s dwelling on Rye Point, and perhaps not more than a half mile from the shore, a long, rough, dark looking body, progressing rapidly up sound (towards New York) against a brisk breeze, and a strong ebb tide. Viewing it with my glass convinced me it was a large living animal. His back, forty to ﬁfty feet of which was seen above the surface of the water, appeared to be irregular, uneven, and deeply indented. I did not at this time remark that his head was more elevated above the water than the ridges or humps on his back. Some trees standing near the water, Rye Point soon intercepting my view of him, I hastened to a situation from which I obtained another sight of him, as he passed that part of the sound opposite Hempstead bay. At this time he appeared to be nearly in the middle of the sound-his body more depressed below and his head more elevated above the water, going with increased velocity in the direction of Sand’s point, creating a swell before him not unlike that made by a. boat towed rapidly at the stern of a vessel. From the time I ﬁrst saw him till I lost sight of him, perhaps could not have exceeded ten minutes, in which short time he had gone probably not less than six or seven miles. Understanding that Mr. James Guion, a gentleman of character and respectability, had seen what was supposed to be the same animal, I yesterday conversed with him on the subject. He states that on Friday the 3rd while on the point of land on the east side of the mouth of the Mamaroneck harbour, he saw at a little distance from the rocks, usually called the Scotch Caps, which lie at the extremity of Rye Point, a large animal going with great rapidity up sound. He judged his speed to be little or no less than a mile in a minute. He describes the irregularity and unevenness of his back, about ﬁfty feet of which appeared above the surface of the water, much in the way in which I have done. I was yesterday informed on creditable authority, that on the day on which I saw the above mentioned animal he was seen by some persons at or in the vicinity of the light house on Sand’s Point. That it was a sea animal of great bulk, to me is certain.—That it is what is usually called a Sea Serpent, and the same which appeared in Gloucester harbour, is only probable (Linnaean Society, 1817, p51-52). General David Humphreys, formerly of George Washington’s staff, was asked to visit Gloucester and collect reports, after which the newly formed Linnean Society of New England was asked to investigate the matter, forming a committee made up of the judge John Davis, Jacob Bigelow M.D., and Francis Gray, and eliciting the services of Gloucester judge Lonson Nash, who collected many of the detailed accounts of witnesses under oath, presenting their findings to the Linnean Society. They determined that the preponderance of the evidence seemed to indicate that they had identified a new species including additional notes on dissections of a captured three foot creature deemed to be an immature version of the sea serpent. They assigned the monster the scientific appellation Scoliophis atlanticus. A Linnean Society of New England was formed in the winter of 1814-15, and during two or three years several meetings were held, papers read, and a few collections formed; but their only publication was a report read at a meeting of the Society on the 18th of June 1817, on the part of a Committee appointed to inquire into the facts relating to the Sea-serpents supposed to have been seen on their shores. This report, a curiosity in its way, consists chiefly of the examination on oath of a considerable number of witnesses, the result of which appears to have led the committee to conclude not only that Sea-serpents of sixty feet or more in length had really been seen, but that a Scoliophis atlanticus about three feet in length, actually captured and described and figured in the report, was the young of the same species. After this effort the Society languished, and was dissolved in 1822, and the remnants of the collections were finally disposed of in 1830 (Bentham, 1867, p303). them individuals of the same species, and entitled to the same name, until a more close examination of the great Serpent shall have disclosed some difference of structure, important enough to constitute a specific distinction” (Oudemans, 1892, p386). Now, basically some guys who knew snakes fairly well studied the smaller serpent and they too found it to be a little odd. This animal, taken off New England, in 1817, had the general form and external characters of a serpent; but was remarkably distinguished from all others of that class, by a row of protuberances along the back, apparently formed by undulations of the spine. From the back of the head to the first of these protuberances, was a distance of three inches and three-fifths of an inch, during which the spine was straight. Between this place and the vent, its undulations were nearly regular, twenty-four of these protuberances, about equally distant from each other, occupying the space between the neck and the vent. From the latter to the twenty-fifth protuberance, the spine formed a straight line, of the length of one inch and nine-tenths; its undulations there commenced again, and were continued quite to the extremity of the tail, forming sixteen more distinct protuberances. The sizes of these forty protuberances were proportioned to that of the body at the places where they were respectively situated. The body could be bent with facility upward and downward as represented, a circumstance not common to other serpents. Those parts of the spine, which were straight, admitted much less motion in a vertical direction, than those which were undulatory (Shaw, 1823, p358). No less than 190 sightings of the Gloucester sea serpent were reported in the 19th century, with another 50 or so in the 20th century. The bottom line is that for a hundred years, people whose business it was to understand the ocean and its residents, the fine fisherman, sailors, and marine specialists of Gloucester, Massachusetts and other seafaring folk of New England just kept seeing a strange beast hanging about. Yet we don’t hear much about our fishy friend the Scoliophis atlanticus anymore. Perhaps the serpent moved on to more hospitable climes, we overfished his hunting grounds, increased boat traffic prevented him from enjoying his customary afternoon nap, he popped back into whatever dimension sea serpents come from, or took up permanent residence at his summer home on Loch Ness. After 1950, the Gloucester sea serpent seems to vanish, and I would ask you to consider that this has nothing to do with whether he ever actually existed or not. Not long after the Gloucester sea serpent started to be taken seriously, the process of his “unmaking” began. We generally don’t even notice this manipulation anymore, as we have institutionally enshrined the separation between “Weird News” and “Forteana”, or more colloquially, there is “news” (the world record for bowling backwards, man swallows fork, crazy crimes like flesh-eating meth-heads, and the human Barbie Doll and plastic surgery fetishist) and there is “nuts” (UFOs, Bigfoot, ghosts, sea monsters, fish falls, and all manner of paranormal phenomena), and when news dares to step across the line (on a slow news day) into the inexplicable or anomalistic, it is almost invariably done in a mocking tone. The anomaly must be subsumed as an explicable outlier at all costs. Consider the explanation offered for the Gloucester sea serpents (great and small) fifty years later by naturalists who suggested the three foot version was simply a black snake with a diseased spine and the larger cousin a misidentified humpback whale. From their description and figures it certainly bore a strong resemblance to the common black snake, or Coluber constrictor of Linnanis, though unique in possessing “a row of protuberances along the back, apparently formed by undulations of the spine.” Competent authorities have since decided it to be but a deformed specimen of this species, though Dr. Storer gives the report entire in a supplement to his Herpetological Report, having, he says, long sought for the paper in vain, for insertion in its proper connection in the Report, and adds: “That this is a new and very curious animal, is acknowledged by distinguished foreign naturalists.” The original animal examined and reported upon by the committee of the Linnaean Society of New England has since been rediscovered, and proved, according to Prof. Wyman, “to be a black snake (Coluber constrictor) with a diseased spine”…An explanation has been recently given by Dr. Pickering as communicated to him by an old whaler, that accounts very satisfactorily for the origin of the various stories of the Sea Serpent that have arisen; namely, that “it was a humpbacked whale scooping fish, the upper jaw being elevated, forming the supposed erected head and neck, and the hump representing the imagined curvature of the serpentine body.” (Allen, 1868, p16-17). Snakes with diseased spines, and the observations of a single old whaler (versus the sworn testimony of dozens of seasoned sailors, captains, and ocean-going folk) suffice to re-encapsulate the Gloucester sea serpent in the realm of the known and discretely identifiable, by experts from afar, who operate on the primary premise that the Gloucester sea serpent “could not” exist, thus any evidence to the contrary must be explained away. This serves the dual purpose of discrediting the original observations, and discouraging future sightings, for nobody wants to be considered a quaint ignoramus. Its puzzling, given the document created by the Linnaen Society of New England that a mere fifty years later, mainstream naturalists and zoologists, in reference to the Gloucester sea serpent made comments such as “That much fable and exaggeration have been mixed up with the history of the Great Sea-Serpent, cannot be doubted” (Jardine, 1860, p313). In the span of less than half a century, legal documents and sworn testimony can be considered mythological. We are able to smile at the monsters described by Herodotus or Pliny as their tales come to us from an ancient past, one we assume did not perceive the world in the way we do (an unfounded assumption, really), and they themselves are very nearly heroic figures in our history. Was the naturalist of 1817 really so alien to the naturalist of 1860 that credible witnesses and learned investigators of 1817 could be relegated to minds clouded by folklore. The reasonable explanations for the sightings began fast and furiously almost right after the Linnean report was released. Obviously, witnesses were simply mistaking pods of dolphins moving in a line, large walruses, whales, and all manner of known species, neglecting the fact that most of the witnesses undoubtedly had far more experience with the variety of sea life in the Atlantic than their critics, and would likely have been a whole lot better at identifying it. The nail in the coffin of the Gloucester sea serpent, much like strange phenomena today, was its ironic popularization (that’s right, I’m looking at you Bigfoot Bounty, Ancient Aliens, Ghost Hunters, and Mountain Monsters). A contemporary Charleston playwright William Crafts penned the play The Sea Serpent; or, Gloucester Hoax: a Dramatic jeu d’esprit in Three Acts, suggesting the whole sea monster thing was designed as publicity stunt by Gloucester. This of course is an almost de riguer cynical accusation made when strange things arise these days. No doubt, sightings continued, and in fact a last report was made in 1962, but tapered off significantly by the 20th Century. I’m not suggesting that “popularity” is necessarily a bad thing, not like one of those insufferable hipsters that has to take a contrary position relative to the rest of society in order to prove a transcendent hipness, rather that the fact of popularization efficiently moves the meme from monster to myth. Is there anyone reading this who cannot give me a concise description of an alien gray? The motif is embedded in popular consciousness, thus were I to actually encounter some pencil-necked, bug-eyed, gray-skinned alien with no nose on a deserted back road, I myself would not even be sure of what my eyes were telling me, wondering if perhaps my mind was filling in blanks based on having been saturated with expectations for how our alien friends should look. And it is far too easy for someone I dared tell about my encounter to dismissively point out that I’ve seen way too much television. One of our endearing qualities as humans is that we desire explanations, and while our explanations are of necessity local, we wish them to be universal. We want sea monsters to either exist or not, with no intermediary possibilities, so we localize the phenomena (an aberration only in Gloucester, despite nearly identical sightings in Norway or Orkney), while universalizing the denial – sea monsters don’t exist, thus you mistook migrating dolphins. We hold dear the positivist gods, but bemuse ourselves with the frail sensory apparatus of our fellow humans, for who but our imperfect species could mistake a whale for a sea serpent. We demand the reality of what we can see, hear, taste, and touch, and then reject such input as fallible. Logic will get you nowhere young man, as this is an unintentional trap pointed out by Charles Fort when he said, “One does not apologize for the gods and at the same time feel quite utterly prostrate before them”. But this is how we make our mythologies. We do so by unmaking our monsters. Allen, J. A. 1838-1921. Catalogue of the Reptiles and Batrachians Found In the Vicinity of Springfield, Massachusetts, With Notices of All Other Species Known to Inhabit the State. Boston: Press of A.A. Kingman, 1868. Bentham, George, 1800-1884. Address of George Bentham, Esq., President, Read At the Anniversary Meeting of the Linnean Society On Friday, May 24, 1867. New Haven, 1867. Jardine, Sir William. The Naturalist’s Library. Edinburgh: W.H. Lizars, 1860. Josselyn, John, fl. 1630-1675. An Account of Two Voyages to New England: Made During the Years 1638, 1663. Boston: W. Veazie, 1865. Linnaean Society of New England. Report of a Committee of the Linnaean Society of New England: Relative to a Large Marine Animal, Supposed to Be a Serpent, Seen Near Cape Ann, Massachusetts, In August 1817. Boston: Cummings and Hilliard, 1817. Newhall, James R. 1809-1893. Lin̄: Or Jewels of the Third Plantation. Lynn [Mass. ]: T. Herbert and J. M. Munroe, 1862. Oudemans, Anthonie Cornelis, 1831-1895. The Great Sea-serpent: An Historical and Critical Treatise. With the Reports of 187 Appearances … the Suppositions and Suggestions of Scientific And Non-scientific Persons, And the Author’s Conclusions. With 82 Illustrations. Leiden: E.J. Brill, 1892. Shaw, Simeon. Nature Displayed In the Heavens, And On the Earth, According to the Latest Observations And Discoveries. London: Printed for Sir Richard Phillips; pub. by G. and W.B. Whitaker, 1823.